Ask The Protein Powder Chef: Do You Have A Recipe For Protein Quiche? 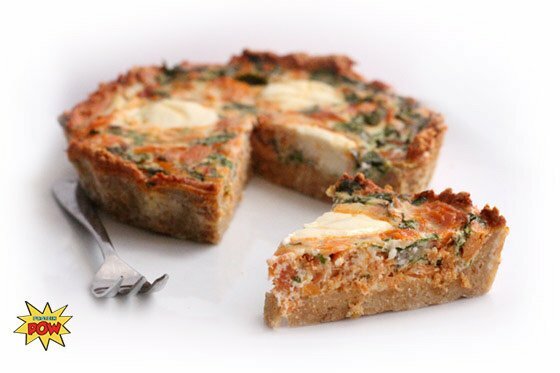 You can't go wrong with quiche, or with the protein crust that's the star of this low-carb dish! Not only is it a great way to eat your eggs, it's also a great vehicle to transport the rest of your meal from plate to palate. Gone are the days of plain toast triangles and jam for breakfast. Oatmeal? Think bigger. Omlettes? Branch out. Pancakes? Think more protein-packed. Enter: protein quiche. Quiche is a great way to pack a golden crust with your favorite fillings, whether they're sweet or savory, and really take advantage of the incredible, edible egg. For this healthier take on the original, I swapped a butter-filled crust with a simple alterative. I created this crust using only three ingredients: unflavored protein powder, almonds, and egg whites. I kicked it up with a bit of seasoning: some salt, white pepper, onion granules, and paprika. I then filled the quiche with a combination of egg whites, cilantro, and smoked salmon. I finished the whole thing off with three dollops of mascarpone. The result was simply delicious! So delicious, in fact, that you have to try it for yourself.